The Next Generation Trek Edition of the Ever-Changing Card Game! 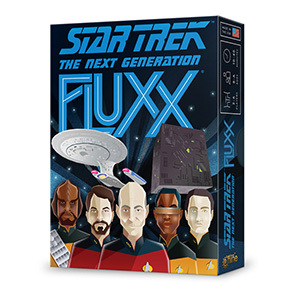 Beam yourself aboard the Enterprise-D for a game of Star Trek: The Next Generation� Fluxx! Join Picard, Riker, Data, and the rest of the TNG crew, to gather the Keepers you need for victory � but don't let Creepers like Q or the Borg keep you from your mission! With new cards like Darmok and the Rule of Acquisition, this version of Fluxx will take you into the 24th Century!